Find the right type of pet-friendly flooring for your home. As a pet owner, you have to make remodeling decisions with your pets in mind. This is especially true when it comes to your flooring. That is why our flooring experts are dedicated to helping you find the best stain-resistant flooring products to fit your specific needs. The easy-care flooring we provide is designed to stand up to all of the stains and messes made by your dogs or cats. We offer a wide range of stylish and durable options that are sure to fit your needs in appearance, performance, and price. Even the cleanest, best-tempered pets can end up causing significant wear and tear to delicate flooring. Before you invest in a new floor, make sure you work with one of our friendly and helpful experts to find out what types of flooring are best for families with pets. We carry stylish and durable floors in a wide range of designs and materials that look great while providing protection against the common issues that come with owning a pet. Resilient flooring is a perfect option for many pet owners. This category includes vinyl, Marmoleum, and linoleum flooring. All of these materials are tough, durable, and engineered to resist stains and scratches. The smooth surface of resilient flooring is water resistant and easy to clean. Just vacuum or mop the floor to make it look like new again. Because the surface of resilient flooring is soft and springy, your pet’s claws won’t click or leave scratches. Marmoleum flooring is a type of linoleum that is made almost entirely from natural raw materials. Produced by Forbo, this material comes in a huge range of styles and colors to suit any home or business. Forbo manufactures Marmoleum using a high proportion of rapidly renewable products and recycled content. 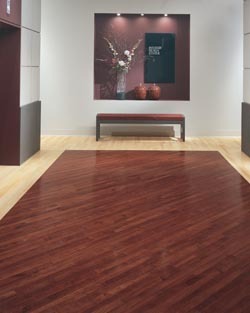 Our professionals are ready and willing to show you all of the great easy-care flooring options there are. We can make sure you won’t have to give up any of the style you want while still getting the easy-care flooring you need. With very little maintenance, our stain-resistant carpet (STAINMASTER® PetProtect®), tile, and resilient flooring options provide protection and strength to keep your floors intact long after installation. You won’t have to give up the stunning beauty of a new floor in fear of what your pet will do to it. Investing in a wooden floor is risky when you have pets in your home. If you choose the wrong type, your beautiful new floor could be ruined within just a few weeks. We recommend parquet floors to families with pets. This type of floor is made up of many small pieces of wood, glued together to form an attractive pattern. This construction results in a floor that lasts for decades with very little maintenance. The patterned surface is very durable and hides scratches. If it does become damaged, the floor can be sanded or individual pieces of wood replaced. Not all types of flooring are good for homes with pets. Some types of hardwood and most softwoods will quickly become scratched if dogs are allowed to walk on them. Carpets without proper stain protection will become stained and collect hair. Natural stone is also a poor choice for pets, as the surface has a tendency to reveal scuffs and scratches. Even laminate flooring may not be ideal. High-quality resilient flooring is a much better option for most houses. If you have any questions about which types of flooring are best for pets, don’t hesitate to get in touch. Our friendly team of flooring experts is always happy to help customers find the perfect pet-friendly carpet or floor for their properties. Over time, carpets collect spills, drips, and dirt. Most carpets require expensive steam cleaning or shampooing in order to remove stains, but our stain-guard carpets are specially treated to resist staining. The fibers of this pet-friendly carpet are coated in a product that repels liquid, so spills will roll off this carpet like water off a duck’s back. This feature makes it an excellent choice for pet owners. The next time your dog or cat has an accident, cleanup will be a breeze. The (STAINMASTER® PetProtect®) carpet is one of our most popular options. The fibers of this type of carpeting are designed to stand up to cleaners that contain hydrogen peroxide, so you can clean up thoroughly after accidents without worrying about discoloration. A moisture barrier also prevents liquid from penetrating through the carpet to the floor beneath. That means you can shampoo or steam clean your carpet without damaging your subfloor. We also offer a great selection of hair-resistant carpets that repel pet hair and fur. Berber carpet is especially good for pets that shed a lot, because the closed-loop construction doesn’t trap strands of hair. Simply vacuum the carpet regularly, and the hair will lift easily away from the carpet’s surface. Whether you have a Persian cat or a St. Bernard, you’ll be glad you chose a hair-resistant carpet. Contact us when you are in need of amazing easy-care flooring for your home. Our dedicated team of professionals is proud to offer our great services to customers living throughout Hooksett, Manchester, Goffstown, and surrounding communities.